The canyon formed by the River Rakitnica separates the massif of Visočica and that of Bjelašnica, in Central Bosnia. The river rises where four smaller rivers meet, it is 20km long with a difference in height of almost 1000m. The experts are without doubt that this is the longest and deepest canyon in Bosnia. The canyon was first explored back in 1956 when an expedition of Bosnian mountaineers and naturalists spent ten days attempting to reach the Neretva, with the aim of gathering sufficient data in order to proclaim it a Natural Park. The expedition was successful and in 2001 the Bosnian documentary film maker Dinno Kassalo followed in the footsteps of this first expedition filming as he went. The result was his documentary film “Expedition Rakitnica”. A few years on local mountaineers and guides have started to take the first tourists into the canyon. These expeditions are becoming more frequent even though only a few hundred people have entered the canyon to date. The so called “tourist route” follows the last 6-7kms of the canyon as far as the mouth of the Neretva, meandering along to the last bends around the Ostro peak. The term “tourist” shouldn't undermine the trip, as it is extremely rewarding yet very demanding and not risk free. It therefore requires physical fitness, a good resistance in cold temperatures and deft ability in the water. Once in the canyon it is impossible to go back, the only way out being at the mouth of Rakitnica. It is necessary to have a local guide, and local guides are in fact continuing to offer more trips for the more daring tourists. The tourist route leaves from the town Konjic, from where you need to reach the village Dubočani, about 20kms away. Dubočani is at an altitude of 1000m, and you arrive by off road jeep. The road leading to Dubočani, being a rough track carved into the mountainside, is a spectacular ride with dramatic views over the canyon of Neretva and the surrounding peaks. After an hour's jeep ride you get to this bowl-shaped village which is set into the rock. Dubočani is one of those villages with only a few inhabitants, which leaves you wondering whoever made them come and live here... From here you leave the vehicles and head down towards the canyon. Canyoning in the Rakitnica differs from classic canyoning which involves abseiling, slides and jumping into water pools. 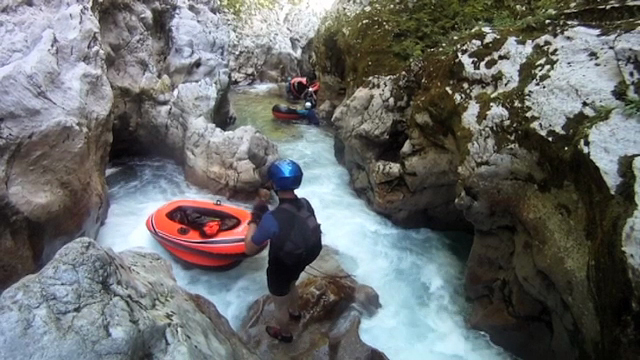 In contrast to mountain canyoning, the Rakitnica is much less steep and far longer, with a stronger water flow. The width of the Rakitnica river bed hugely varies from about 20m near Dubočani to merely not even one metre at its narrowest point. This difference creates stronger water pressure which together with rapids and small waterfalls causes the biggest difficulties when passing through. From where you set off, the Rakitnica Canyon is quite wide thus giving you around 2kms to get used to it before reaching the challenging part. Different guides use different ways to go along the canyon, some on foot and others lying front down on small dinghys. The advantage of small dinghys is that they allow speed and safety when passing over the first small rapids and deeper parts, where you would otherwise have to swim. You soon get used to the dinghys and going over the rapids becomes a sort of natural gymkhana between rock and water, as you follow the currents to get down. Then the canyon suddenly narrows and the first difficulties arise. On some stretches it is necessary to rope up for safety and now you enter the most spectacular and challenging part. Two rock faces hundreds of metres high mean there's no way out. Over millions of years the water has carved out spectacular shapes, and trout and fresh water shrimps live undisturbed. In the central part it is vital to understand the water flow in order to steer yourself to safety between rocks and whirlpools. At times you need to climb along the canyon's edge, other times you leap straight into it holding on to the dinghy, or you find yourself jumping in from tree trunks lying across the canyon. Once out of this narrow stretch you keep on to the last part for about another 2kms, this stretch being similar to before but with faster rapids, natural caves, a couple of tributaries and some small beaches allowing you to rest after tackling the narrow, winding Ostro. At the end, a suspended wooden bridge over the canyon marks the mouth of the Rakitnica, and it's time to put your feet back on solid ground and return to civilisation. It takes about 5-6 hours to go along the canyon with dinghys, depending on the group. In Bosnia Herzegovina the Piedmont region leads the Action aimed at developing holiday farms in the mountainous areas of the SeeNet II Programme, with a strong enphasis on the recovery and promotion of places suitable for outdoor sports. We are now where the Rakitnica meets the Neretva, which flows nearby, and where you can do traditional rafting. However, at this point you've spent enough time in the water, and so we head along a woodland path leading to where the vehicles await. This path is not to be missed with its wonderful views over the Neretva Canyon, Prenj and Visočica. At a certain spot the path gets wider and passes through tiny villages where the inhabitants are already getting ready for the winter. The last thrill, before the adventure draws to a close, is the high wooden suspension bridge which you need to cross to pass over the Neretva, which may not seem so daring after the excitement of the Rakitnica whirlpools. Once over the bridge the adventure ends and this is the meeting point to get back to Konjic. From the departure point at Dubočani to Bukovica, where we arrive, it would be about a 50km drive along mountain roads and off-road.